Our cruise creates glorious space on board for passengers to fully enjoy cruising on the most picturesque landscape of Vietnam. With our large sea-view cabins offering boutique interiors with oak-wooden wall, you can feel not only warm like home but also harmonic with the beautiful nature outside .Come with Vietnam Typical tours company is your best choice. 12:30: Boarding to the Gray Line Halong cruise junk. Tourists will be welcomed drinks to warm up their execitement. Moreover, in order to make sure tourists will have a completely sucessfull Cruise, cruise will have a briefing and check in cabins for tourists. 13:00: Tourist will have lunch on cruise that is set perfectly. 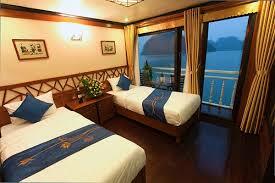 Besides, Cruise’s staffs will give you the professional service ever. Junk will run heading to Vung Vieng Floating Fishing village. 14:30: Finally tourists arrive to the Vung Vieng fishing village and visit this village by local rowing boats. During the trip, tourists will catch up the precious experiences. Tourists will have 02 options to choose the way to go visiting the village: by joining rowing bamboo boats or kayaking by yourself. Tourists will pass through floating houses of 65 families, a floating school & floating information centre. 15:45: Tourists come back to the cruise and continue cruising to Drum cave. 18:30: Cooking demonstration will be on the sundeck. Let’s see how to make the fresh fried spring rolls and mix fish-sauce. Tourists will not forget these delicous dishes that is unique in Ha Long. Or how to make a flower from carrot…by our skillful chefs. 21:00. Board and card games are available or join the squid fishing on boat with our crew. Moreover, tourists can enjoy the squid with our cook chef after catching them. Karaoke singing on Star bar – sundeck, with variety languages: English, Spanish, Russian, French…. 22:00: Overnight anchorage near Drum cave area. Now it’s time for tourists to relax comfortably and have a deeply sleep on our king beds with beautiful dreams as in a fair-tale story. 06:30: Wake up in early morning, tourists can not miss to welcome the dawn on the sun deck to refesh and get start for a new day. Tourist will do Tai Chi on the sundeck to get full of energy. 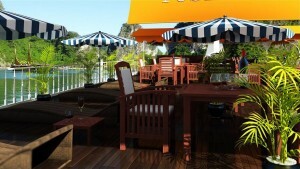 Enjoy Tai Chi instructions on the sundeck in 30 minutes. 07:30: Tourists will be served breakfast include Coffee, tea and Bakeries on board. 10:30 – 12:00: Tourist will admire the village’s scenery then trekking in the core of Cat Ba National Forest to Bat cave. Tourists can enjoy village scenery, trekking in the core of Cat Ba National Forest to Bat cave, then trekking back the village (800m/ 1 way). 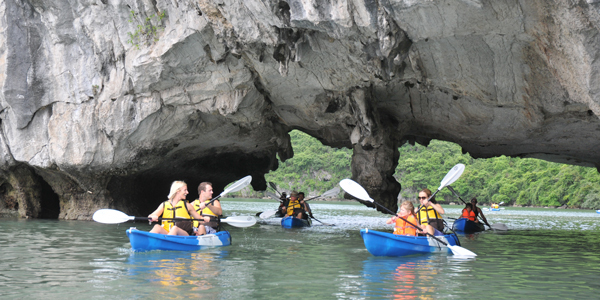 14:30 – 17:30: Tourists have one more chance to visit Dark Cave by kayaking and swimming near the boat in new fresh environment with special feeling among wide blue sea water. 18:00: Now it’s time for tourists to relax on the sundeck for sunbathing with fantastic views and can not miss to take some sunset snapshots. 19:00: A-la-carte Dinner is served with a variety of Halong seafoods. Tourists will not forget these delicous dishes that is unique in Ha Long. 21:00. Board and card games are available or join the squid fishing on boat with our crew. Moreover, tourists also can enjoy the squid with our chefs after catching them. Karaoke singing on Star bar – sundeck, with variety languages: English, Spanish, Russian, French…. 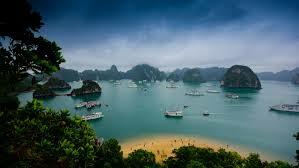 Or simply, tourists can enjoy the Halong bay at night, it is now like a floating city, with twinkle of light from hundred Cruises, so great. 06:30: Greeting dawn on the Bay, tourists can join the Tai Chi class, if the weather condition allows or upon guest’s request. 07:30: Tourist will be served breakfast include Coffee, tea and Bakeries on board. 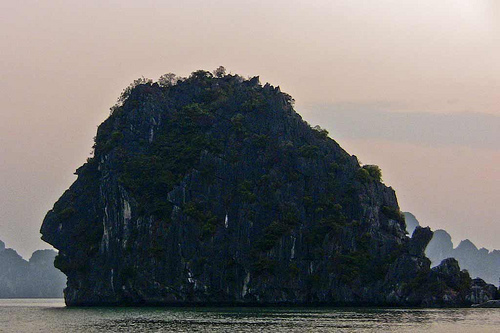 08:30: If tourists have seen some movie about paradise, Amazing cave will help tourist to see in naked eyes. Tourist will have an opportunity to visit Amazing cave discovered by the French in 1901 and opened to tourists since 1936 and symbol for geology value of Halong. This cave with colorful lights is attract millions of tourists every year. 11:30- 11:45 : Disembarkation at Tuan Chau Marina, Tourists return to Hanoi.